The stats for an assembled machine. 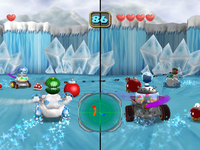 Super Duel Mode is a side game mode in Mario Party 5, hosted by Skolar. 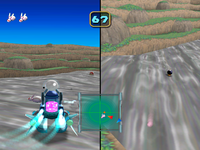 It is a one-on-one battle mode in which two players face off against each other using custom-assembled vehicles (called "machines"). 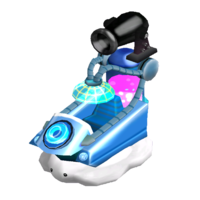 In this mode one buys machine parts using points received by playing minigames in either Party or Minigame Mode and builds a battle machine to use in different tournaments or against friends. There are a total of 44 different parts that can be used to customize a machine. To unlock all the different parts, one must play all the tournaments and beat certain opponents. 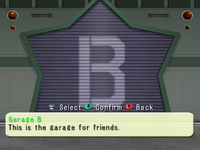 The following areas are available in Super Duel Mode's initial segment, the Garage. Service Desk In this area, players can buy vehicle parts from Skolar. 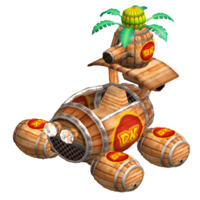 Whenever players play minigames prior to talking to Skolar in the Service Desk, Skolar keeps track of the number of minigames played and converts it to points. 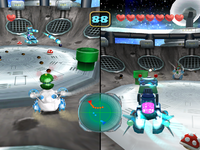 Players can also participate in trial battles, where players with a randomly generated vehicle and characters based off what is unlocked is pitted against a computer-controlled Koopa Kid. 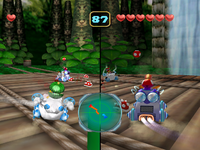 If a second controller is plugged to the second player slot, the Koopa Kid is replaced with player two, who is also randomly generated. Garage A-1 This garage is owned by player one. In this garage, player one can build a machine from scratch when first accessed. 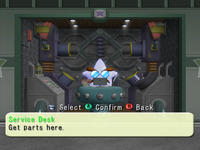 After the machine is built and given a name, player one can make any modification to it. Player one can also inspect the machine's stats, pit the machine against other machines either in a Vs. Match or D1 Tournament, or even delete the machine. Garage A-2 This garage is owned by player two. This garage behaves identically to player one's garage, except it is controlled by player two. Garage B This is a garage for friends. It is controlled by player three. 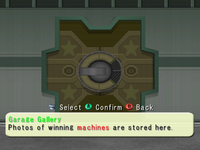 In this garage, players can download machine data from the memory card in slot B.
Garage Gallery Photos of winning machines in D1 Tournament mode are stored here. 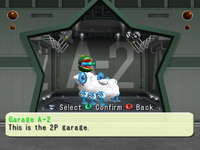 They can be viewed in a 3D perspective and adjusted using the buttons of the GameCube controller. 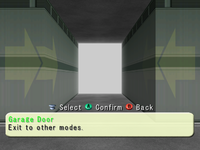 Garage Door This lets the player exit Super Duel Mode. 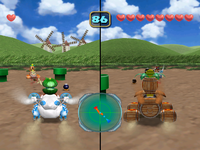 Playable characters do not have any noticeable differences except for the color on their steering wheel. Note: * indicates characters that are not available as playable, random characters in trial battles. 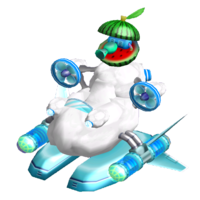 If there is only one player who participates, however, the AI-controlled Koopa Kid is always the opponent. Defeat Donkey Kong in Hard Competition. A few machine parts have unique properties not stated in the in-game description. 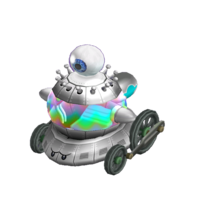 Although the Skolar Body takes mostly the same amount of damage from machine attacks as any other body, the Skolar Body receives less damage from stage hazards. 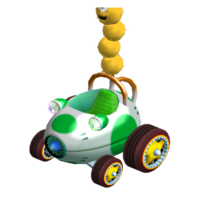 Both Wiggler and Super Wiggler Tires allow the machine to rotate in place if the machine is stationary. Spiny Tires do not slide on slippery terrain compared to other grounded tires. 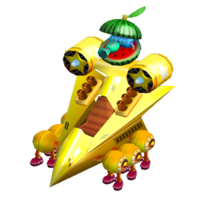 The E. Gadd Jet and Lakitu Cloud hover slightly above the ground, meaning that hazardous terrain such as lava cannot damage the machine. 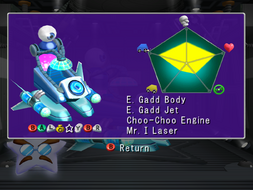 These body types deal mostly with health units on a machine, although they can also modify speed. Tires can modify speed, acceleration, and handling. Engines shape largely how fast machines move and how well they handle. 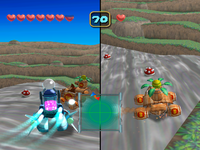 Engines are not visible during battle; however, a machine's running sound can differ when different engines are used with it. Weapons modify mainly the machine's attack stat. All weapons also have weight; heavier guns lower the machine's speed more than lighter guns. 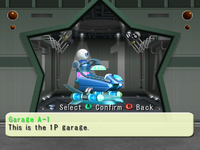 The player can choose the battle from the garage menu, but only Battle Competition on easy and normal are available at the start. 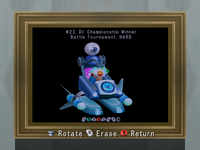 If the player loses any game, the tournament ends and the player receives no trophies. 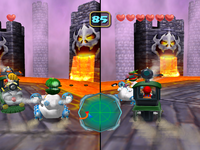 On easy mode, the player faces mostly Koopa Kids and few other characters. In normal mode, there are more unique characters and less Koopa Kids. 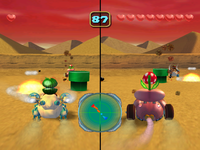 In hard mode, Koopa Kids are absent and Bowser and Donkey Kong appear in the competition. 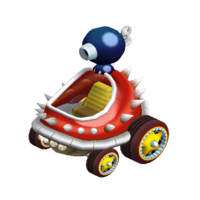 In all competitions, there are obstacles, such as stationary Spiny Shells or Bob-ombs that detonate within a certain amount of time or upon contact. The size of a Bob-omb mirrors the damage it can do. Warp Pipes simply block machines. 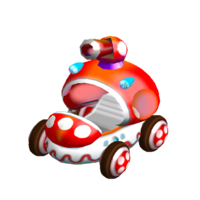 Mushrooms occasionally appear along the course and grant the machine better speed and control for a certain amount of time when collided with, as well as Poison Mushrooms, which hinder speed and control. Terrain can vary in an arena called Random Ruckus. Dirt and grass are present and do no special effects. Metal and ice make the machines harder to control. Lava damages and pushes away the machine. Mud makes vehicles slower. 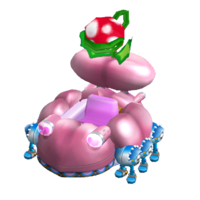 However, if a machine is equipped with Lakitu Cloud or E. Gadd Jet tires, the machine does not get affected by any sort of terrain while Spiny Tires negate sliding. The goal of this 90 second game is to eliminate the opponent. If the timer runs out before a player is eliminated, the player having more health left wins. 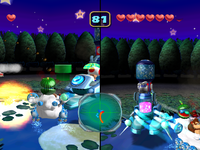 The player must fire the weapon with at the other player and keep moving to avoid opposing attacks and obstacles. 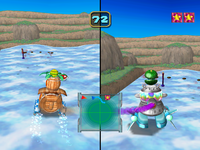 In this game, the object is to collect three flags before the opposing player does. This game's time limit is also 90 seconds; the game ends if nobody collects three flags. Although hitting the opposing player immobilizes him or her momentarily, attacking the opposing member is not the goal of the game. The goal in this competition is to wipe out three Robo-Rabbits before the opposing player does within the time limit of 90 seconds. 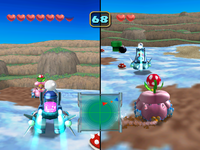 Again, the player can shoot and stun the opposing member. 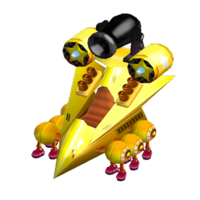 The Robo-Rabbits are fast, move erratically, and can tunnel underground. Daisy's machine. Fast, it's no pansy! 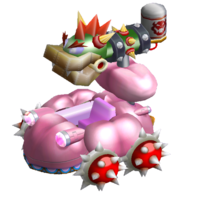 Bowser's machine. Get too close and you're toast! These arenas are playable only in Vs. matches. In D1 Tournament, the arena is always a variation of Random Ruckus. There are a total of eight arenas to battle in. Green Meadow Battle in a big field under blue skies! Moonlit Midnight Battle in a big pond under a starlit sky! Quicksand Desert Battle in sand within a limited area! Snowy Slope Battle on slippery ice surfaces during a raging snow storm! Jungle Falls Battle on a suspension bridge with a bamboo backdrop! Lunar Outpost Battle in a big bowl-shaped crater on the surface of the moon! Bowser Stadium Battle on a stage surrounded by dangerous hot magma! Random Ruckus Battle in a new environment with each battle! 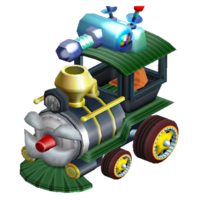 Shuppō Bodi Choo-Choo Body; from ｢しゅっぽ」 shuppo, a Japanese onomatopoeia for the sound a train makes. Suteresa Bodi Stalth-Boo Body; a portmanteau of ｢ステルス」 sutresu, "stealth" and 「テレサ」 Teresa, the Japanese name for Boo. Shuppō Taiya Choo-Choo Tire; from ｢しゅっぽ」 shuppo, a Japanese onomatopoeia for the sound a train makes. This page was last edited on March 11, 2019, at 20:52.